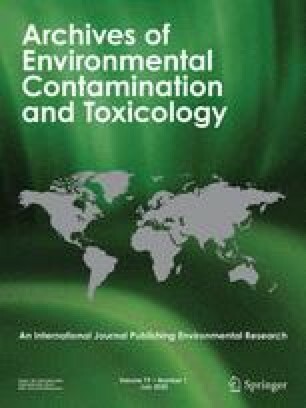 Earthworm acute toxicity, plant seed germination/root elongation (SG/RE) and plant genotoxicity bioassays were employed to evaluate the remediation of a lead-contaminated soil. The remediation involved removal of heavy metals by a soil washing/soil leaching treatment process. A portion of the soil after remediation was rinsed with water in order to simulate exposure to rainfall. The bioassay results showed that the soils before treatment (BT) and after treatment plus water rinsing (RT) were not toxic to earthworms in a 14-day exposure, while after treatment (AT) showed significant toxicity. The LC50 values for Eisenia fetida and Lumbricus terrestris were 44.04 and 28.83 (as % AT soil supplemented in artificial soil), respectively. The phytotoxicity data indicated that all three test soils significantly inhibited lettuce SG/RE in a dose-related manner, with AT being the most phytotoxic. In oats, RT had no effect on SG/RE and AT was more toxic than BT. For the two local site grass seeds tested (blue grama and sideoat grama), the AT soil was the most phytotoxic followed by BT and RT. In Allium cepa (common onion), BT and AT induced similar levels of genetic damage to root tip cells, whereas RT was not genotoxic. High salt levels generated during the remediation process appeared to be responsible for the increased toxicity of AT soil for both plants and earthworms. The rinsing of the AT soil with water effectively removed both acutely toxic and genotoxic components of the soil.